If you are looking for some amazing wedding photography firms or professional wedding photographers in Mumbai, then scroll down to have a look at few of the best wedding photographers in Mumbai. I have picked and chosen 10 amazing wedding photographers who click pictures that will be frozen in time and give you something to reminisce everytime you look at them. And you know what’s the best part? All these wedding photographers in Mumbai are sure to fit in your budget and not empty your pockets. Read on to know who these Wedding photographers in Mumbai are and what are their charges per day! Established in 2012 by Sonal Dalmia, Clicks Unlimited believes that photography is not only about presentation, but about bringing out the expression & capturing the essence of each moment. Their forte is Candid Wedding Photography and Bridal photography, but Sonal also loves to do Save The Date, Engagement and Post & Pre Wedding Photography is Mumbai and elsewhere! Clicks Unlimited Wedding Photography packages start at Rs. 40,000 per day! The team at Picsurely knows the significance of memories in life and so they strive hard to document them in heart warming pictures and videos. Their team has creative and extremely professional photographers and cinematographers who capture and transform moments into lifelong memories. Picsurely marriage photography packages start at Rs. 50,000 per day! Shutterbug Photography is the team of 4 photographers in Mumbai who capture in sync to bring out your best wedding moments to life through pictures and cinema. Their wedding photography packages start at Rs. 40,000! Driven by the passion of capturing precious moments of a wedding and create everlasting memories, Dreamcatchers Photography was founded by Punit Desai in 2008. His aspiration is to create artistic imagery and has covered over 150 weddings so far! This wedding photographer in Mumbai prices his wedding packages beginning from Rs. 55,000 per day! The Photo Tree is a wedding photographer in Mumbai, which was started by Lakshay Chauhan. He is graduate in commerce who always wanted to capture life moments instead of writing accounts for companies. At The Photo Tree, Lakshay and his team learn what style, interest and character their clients have, so that they can capture every second naturally. Their candid photography and wedding photography packages start at Rs. 40,000 per day! Meenakshi Jain of The We Do Moments believes that there is no union more beautiful than love, and say that her aim is to always make the memories of your special day stay forever special. Her pre wedding photography and marriage photography prices start at Rs. 50,000 per day! Movie’ing Moments wedding photographers in Mumbai charges Rs. 60,000 per day! Two Cups Coffee and A Camera is a duo of wedding photographers in Mumbai who have been happily clicking since 2015. Gulshan brings in high levels of planning, professionalism and perfection along with his photography skills, while Fahim blends his taste for photography and cinematography and into the rich and vibrant colours of a wedding. Their marriage photography packages start at Rs. 55,000! 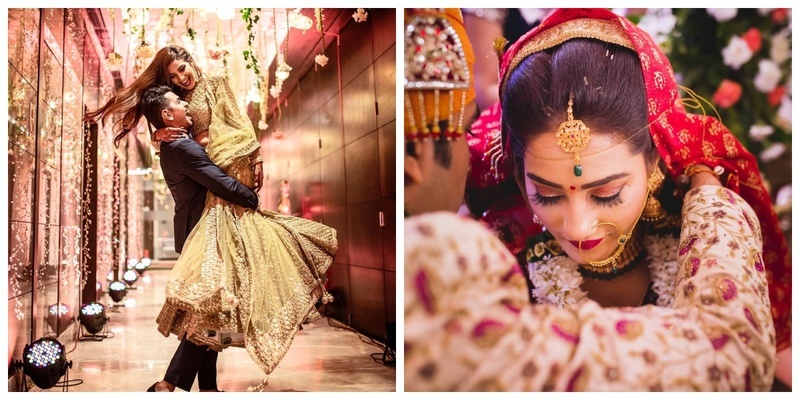 Nimitham Wedding Photography in Mumbai believes in the craft of non-intrusive photography and artistic excellence to document the most candid, casual and real emotions involved in a wedding. Their wedding photography packages start at Rs. 65,000 per day! Wedding Art is a team of professional photographers and cinematographers, who are driven by passion, camera expertise and attention to detail. Their team of photographers blend into your wedding background and strive to capture the most minute details, so that your wedding album is full of beautiful memories. They offer services like candid photography, traditional wedding photography pre wedding photography and customised albums. Their packages start at Rs. 25,000 per day! Did any of these wedding photographers in Mumbai catch your fancy enough to book for your big day?